Why can't these people just be honest? I don't know how Erotica 1 can stand to be around such deceitful people. Erotica 1 is one of EVE's brightest beacons of honesty and integrity. Oh dear ... he was not in a public library, was he? Lying during a trust game is generally considered a fail. ... to lie to an honourable business person like Erotica1. If only he had told the truth he could have cashed out big like I did. moral of the story: sing "im a little teapot" as fast as you can, so the phone doesnt ring during your love song encore, AND TAKE THE MONEY! Wow, what a bunch of sociopathic sickos you lot are. You seem like the type that killed small animals when you were kids just for kicks, but I don't think your lives are nearly as interesting as that. Have fun getting your jollies off at someone else's expense. And when you're done, why don't you go and tell your mothers so they can be so proud of you and get you to brush their hair again. Sounds like someone is having a bad day, would a hug help? 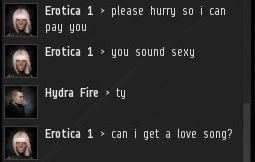 You should have you isk doubled by Erotica 1. I did and I felt much better after. 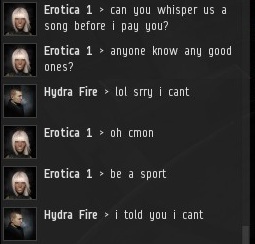 Hydra didn't even sing loud and proud. 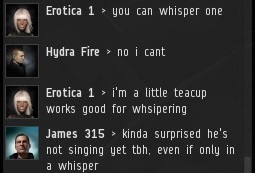 For the service Erotica provides I would sing in public no matter the crowd. Exactly how does redistributing pixels in an online game equate to torturing animals? Why do you have this fascination with animal torture? You sure are an angry elf. What's wrong, is mining no longer relaxing to you? You're an idiot. Now that that's out of the way allow me to explain why. One should not compare an individual in a video to an individual in society who suffers from mental illness/es and say they are the one and the same simply because of how one plays a video game. Once you start comparing Real World issues with video games and people you don’t like who play these video games in an attempt to support your argument, you become a strange, strange person. Despite what you think they are not the same. They are completely different. Let’s continue, EVE = Everyone vs. Everyone. For example, if I see a wreck and I know the owner of that wreck is coming back to collect, I'm going to check it out to see what's inside. If it's worth my time, I'm going to loot/steal it. However, if someone drops their backpack, or purse, I'm not going to walk up to it and check what's inside to determine if I want to take something. On the contrary, I will try to get that person's attention to let them know they dropped something. But that's the difference between RL and a fantasy video game. I hope you’ve learned something today. @anonymous: Let me try to answer some of your questions, they are quite piquant and deserve answers. "Who are the advocates of TNO to say that the way they play is the "incorrect" way?" "Why not try your hand at fighting those who can fight back?" Here is my spout (other arm out with elbow and wrist bent). "Just understand that when you guys encounter the resistance that is well on it's way, that it too is happening out of "emergent" gameplay,..."
Can the New Order actually sink any lower? You can't troll the New Order as they are actually proud of their 'achievements'. Although what these amount to is not something the vast majority of players would recognise as such. 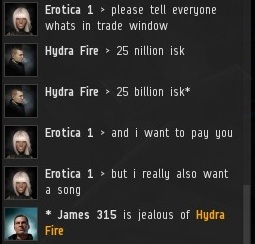 Erotica 1 is probably one of the best isk scammers I've ever heard of. His methods are very sophisticated, unconventional, well-worded and surprisingly believable. 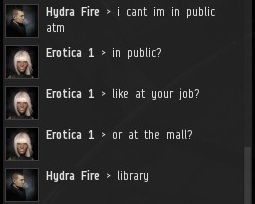 Compared to him, all those Jita "1 trit", "Gnosis sell" and others look like total amateurs. 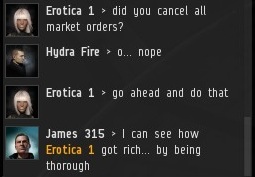 I can predict that Hydra ends scammed of everything he previously owned. 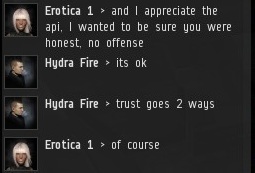 I hope it will serve him as a warning, that all "easy money" schemes, isk doublers and lotteries are fake, no exceptions, that his own work is the best method of earning money, and that noone in Eve can be trusted. Erotica 1 is a genius for sure. Probably on par with James. But neither is a scammer. I sent her a billion and got 3 billion back, without even testing smaller amounts. The same day I got that, I saw a number of people break the rules and have their donations kept, as they should have been. I would have sent more if I could. 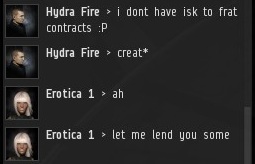 Hydra's greed is probably what messed things up for him. I believe greed is one of the seven deadly sins. What is the gripping shocking end to this???? 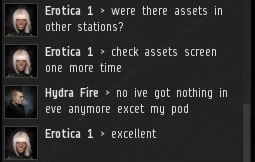 Seriously, this has been posted on the in-game forums and Hydra says Erotica took everything... there is no reason to drag this out for days. There is no real anticipation since the outcome is known. It's just sad that stories like this take days upon days to get posted when I am sure there are NO kills that should be being posted daily. But, seems that since James was involved in this scam the NO Agents get left out of the stories while James discusses his actions. I'll listen to the story as told on minerbumping.com, the premier news source for highsec, thank you very much! People can say what they want on the forums, but we will show them the truth here. Sadly James315 does waffle/rant a fair bit however in his defence he is preaching to his unwashed followers here. James is a prophet for sure. 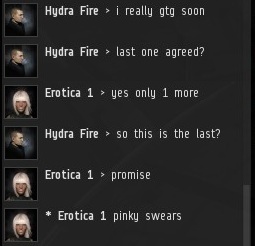 I think that's why the masses refer to him as the savior of Highsec. Years from now hopefully this website remains intact so that generations do not have to rely upon stories of his miracles being passed down from father to son. Who else but James 315 could attract followers as diverse as he has? 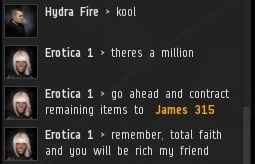 I mean, even some of Eve's super rich such as Erotica 1 are freely giving to his cause.